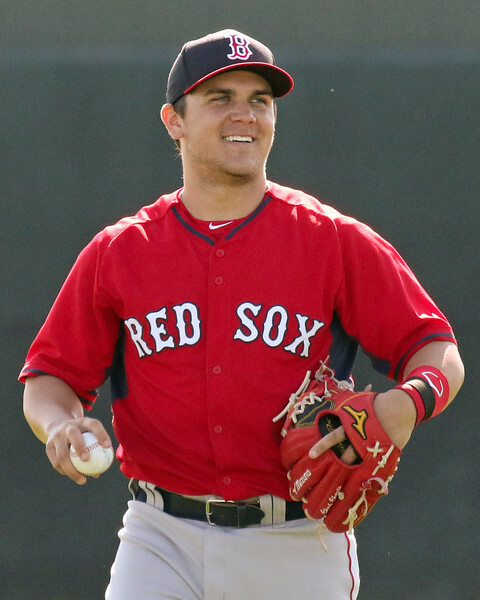 SARASOTA, Fla. -- Rare are the moments when expectation and reality meet, but for all the excitement Michael Chavis brought to the opening game of minor league spring training, it is safe to say his debut performance lived up to what he hoped it would be. Chavis reached base in all four appearances in a win for the Low A Greenville squad over the Orioles' Delmarva team on Wednesday, falling a single short of the cycle at the Buck O’Neil Complex at Twin Lakes Park in Sarasota. It was a welcome way for the 26th overall pick in the 2014 draft to kick off his first full season, given he had to make an adjustment to the professional game that often gets overlooked: after a lifetime of year-round baseball, he had to deal with an offseason. Chavis worked on his game during that time, of course, and took his break between attending the Fall Instructional League in Fort Myers and the Red Sox Dominican Instructional League to develop his mental approach to the game and prepare for what he hopes to be a full-season grind. He said team officials let him know he could earn a spot with the Drive when camp breaks, and judging by how he opened the spring training games, that is his goal. In his first at-bat, facing the Orioles’ top pick in 2014, left-hander Brian Gonzalez, Chavis took a first-pitch fastball before taking an outside fastball the opposite way and legging it into a triple. In his next at-bat, Chavis again took a first-pitch strike before turning on a knee-high, inside changeup that cleared everything in left field. Later in the game, he sent a fastball from left-hander Travis Seabrooke down the right-field line. Chavis had eyes for his second triple of the game and appeared to beat the throw, but was called out, though the credited double brought him close to the cycle. In his final at-bat, Chavis walked on five pitches. A friend from the Orioles organization ribbed him after the game that he should have swung for the cycle regardless. All of his success came from those frustrating intrasquad games leading up to Wednesday, Chavis said. He admitted to chasing outside the strike zone since he arrived, and at the urging of minor league hitting coordinator Tim Hyers, adopted an intentionally patient approach for Wednesday. Selected with the first of Boston’s two first-round picks last year, Chavis said he was excited to have the draft process over with and move on to a new chapter. He ended up getting three new chapters: a Gulf Coast League stint in which he hit .269/.347/.425 with one home run, 12 doubles, and 16 RBI in 39 games, then the stints at the two instructional leagues. The pressure that comes with being a top prospect in the draft and having your future hanging at the whims of 30 major league general managers gave way to the excitement he typically brings to the game. His smooth swing, position, and unbridled love for the game will earn him comparisons to fellow third base prospect Garin Cecchini. But Chavis will have plenty of company at the hot corner within the organization not just with players at other levels of the organization, but along the same development path, specifically in the person of Rafael Devers. This story has been updated to accurately reflect when Chavis was drafted. Jon Meoli is a senior columnist at SoxProspects.com and a writer at the Baltimore Sun. Follow him on Twitter @JonMeoli.